The House of Commons are pleased to offer the opportunity to dine in the magnificent surroundings of the Palace of Westminster's principal dining rooms, the Members' Dining Room and the Strangers' Dining Room, where seasonal ingredients from across the United Kingdom are paired with sublime presentation and elegance. Table reservations for up to 8 pax, are available for lunch between 12:15pm and 2:15pm and for dinner between 6:30pm and 8:30pm. 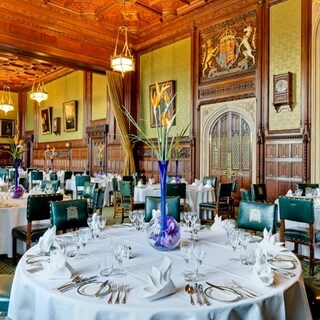 At one time intended as a conference room and known as the ‘Painted Chamber’ after a room in the old medieval Palace of Westminster, Members’ Dining Room was created in 1871 following demands for more dining facilities. The Strangers’ Dining Room was originally a Peers’ committee room, which was later transformed into a dining facility in approximately 1867, and renamed the Strangers’ Dining Room during the interwar period. When Parliament is in session, the room is used by Members to meet their guests and these visitors are referred to as "Strangers". 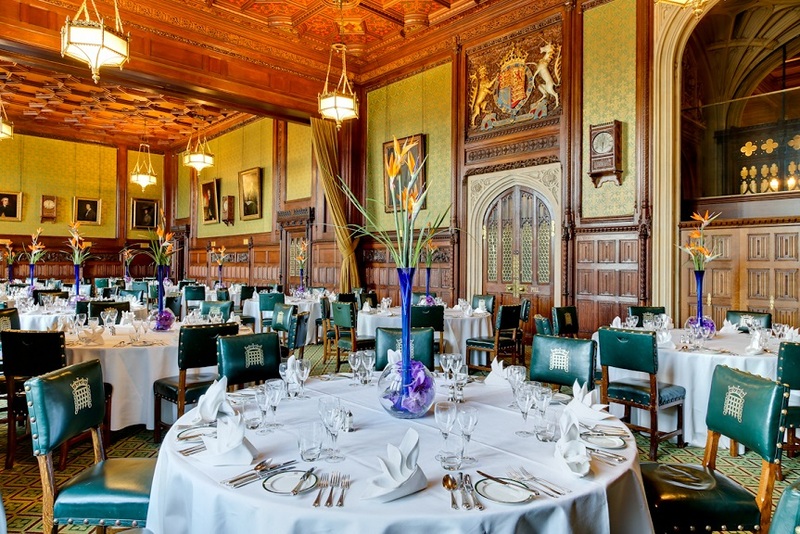 The House of Commons is a very British affair with the promise of courteous service and top end British cuisine. Classic styling comes in the form of white tablecloths and political themed art-lined walls. High painted ceilings, huge windows that look out over the Commons Terrace and carved oak panelled walls give these dining rooms a sense of grandeur and political intrigue unlike any other restaurant. Expertly crafted by our in house team of award winning chefs, the menu is effortlessly stylish and celebrates fine British cuisine, modern and refined with the focus on seasonal ingredients. We operate a dress code at the House of Commons of smart casual as a minimum. Collared shirts are preferred for gentlemen, with long trousers and shoes. Sportswear and trainers are not allowed in the dining rooms. In consideration to all our diners we operate a child policy of 6 years old and above. They must always be accompanied by an adult. Smoking is prohibited, including the use of e-cigarettes. Assistance dogs are permitted with prior notice. Lamb , New Zealand White Wine and waiter where great. The opportunity to dine inside the House of Commons was great as our daughter is very interested in politics and so we took her for her birthday. We all loved the food, service and the ambiance of the Strangers' Dining room. The staff were cheerful, helpful and at all time professional. Thanks to them we all had a fantastic night. Service team were so professional and friendly. Amazing food and ambience. Having had a very long wait in the security queue we were not happy. However, the quality of the food and the spectacular service from the staff more than made up for it. Being an awkward vegan diner I usually feel bad for requesting a special meal. The staff made me feel like it was no bother although I could see a lot of thought has gone into my meal. Divine. Thank you everyone. I wish I could come again but alas you appear to be available only once per year. Wow! What an amazing dining experience- the food was exquisite, beautiful flavours and very well thought out. Service (especially from Joe) was second to none and the ambiance was perfect! We will be back. It was very embarrassing because, having booked the meal for a family group, we were shuffled from person to person looking for the correct dinning room. Each person asked us the name of the room/ event we should be in, saying it was noted in the booking confirmation, however, it was not and hence we struggled to locate the correct dining room. I would have been very helpful to know the name of the dining room i.e  members or strangers room. In addition contact details for the events manger failed to work as you close at 6.0 pm and our problem arose at 7.0 pm/ In addition, I had mentioned that we had one person  with  a gluten allergy but no gluten was available. Finally 2 of our party had the onion tart starter which was most disappointing, being served as dish of what looked like uncooked pastry, raw red onion and a piece of goats cheese. It far from what the menu suggested, was unpleasant to eat and was underwhelming. Fantastic experience for all the family, elegant dinning in a historical location overlooking the Thames! The customer service was the best we have ever encountered and extremely friendly and professional. The presentation of the food was outstanding, and we were all made to feel very special, a massive thank you!! We really enjoyed it - service superb - as was the food. Waiters made us feel very relaxed whilst explaining parliamentary related happenings too. All in all a wonderful evening - only suggestion I would make would be to offer an alternative slightly cheaper version too of the menu as it would be nice to make it more affordable, which would attract more people, including those who may never have stepped inside the House of Parliament before and would benefit from knowing more etc. Thank you again! We had a lovely dinner. Excellent service and surroundings! Lovely experience. Superb service, second to none but very pricey. Top quality food. Eating in the House with friends was the best celebration we could have imagined with them. Special does not quite explain the look on their faces as we arrived at Westminster and directed them inside for our dinner. The welcome was excellent, food  and service excellent and even the security staff discussed the history and function of the building. Had a very courteous waiter. We brought visitors from Australia and they thoroughly enjoyed this unique experience. Dining at the House of Commons is a real treat and a delightful way to entertain out of town guests - they love it... as do we. Service is charming.... Food worth a star... environment is so special. Note there is  airport style security, as one would expect. We had a very good evening . Food was very good, very tasty and better than expected. Service was a let down at the start but improved as the night went on. Our waiter and Sommelier were superb ! Food was good and we did not feel rushed. presided over by a top notch Maitre D.
This was a unique dining experience in the heart of Pugins finest interiors. The food was delicious and our host Terry looked after us in fine style. Would recommend and definitely go again. It was a lovely evening in the Strangers Dining Room - such a unique opportunity. A set menu with a good range of options. Wines were nice and cold. It was a very warm evening! Staff incredibly friendly. Incredible venue and all worthwhile. Food is a bit overambitious—probably in an attempt to justify the high price tag. I’d be happy with a simpler menu and larger portions.